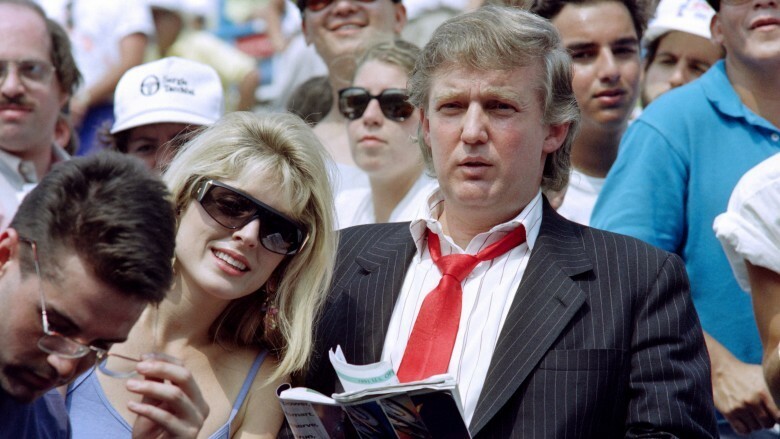 For more than a decade, Donald Trump's messy marriages, and equally messy divorces, from Ivana Trump and Marla Maples were splashed across the pages of tabloids. But what caused the state of these unions to be such a headache for the 45th president of the United States—and such a field day for gossip rags? From affairs to lawsuits, we're taking a scandalous trip down memory lane to reveal what you may not know about Donald's notorious ex-wives. According to a well-researched summary of events from the now-defunct blog Gawker, Ivana and Maples had an infamous altercation in 1989, when they both just so happened to be at the same ski resort in Aspen, Colo. Details on the event vary, although every report curated by Gawker concludes that, duh, the spat was about Maples' affair with Donald. Among the juicier allegations: People magazine claimed Ivana confronted Maples outside a restaurant, calling her a "b**ch" and demanding, "leave my husband alone." Sources for People also alleged Donald took off on his skis during the spat, after which Ivana allegedly caught up to him and "[skied] backwards down the slopes, wagging her finger in his face." Whatever the case, the couple's divorce was announced a little more than one month later. 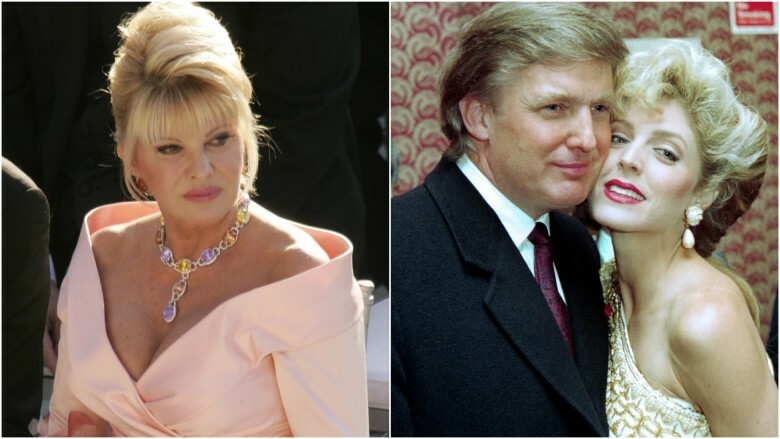 Although the couple's divorce was announced in February 1990, Ivana and Donald did not reach a settlement until March the following year, due in part to a spat over the couple's prenuptial agreement. 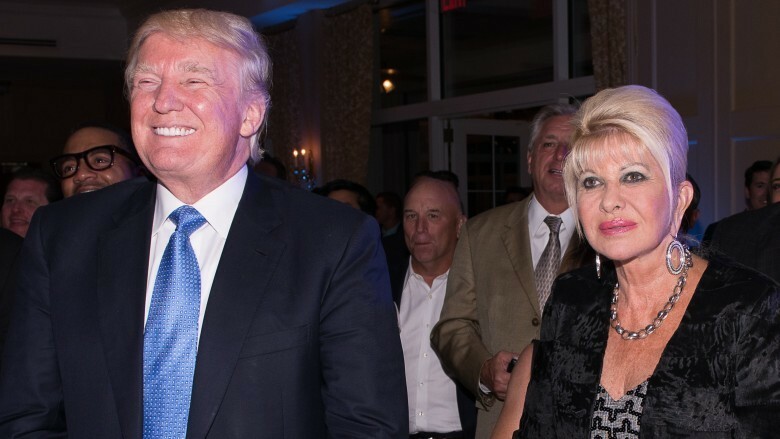 According to The New York Times, the wait paid off for Ivana, who walked away with "$14 million, a 45-room Greenwich, Conn., mansion, an apartment in the Trump Plaza, and the use of the 118-room Mar-a-Lago mansion in Florida for one month a year." The report also claimed she would receive around $650,000 annually in child support payments. At the time, The New York Times said it was unclear how Donald would come up with the money to pay Ivana, due to his alleged financial troubles. Despite the settlement, which followed an initial agreement in December 1990, the ex-couple continued to battle it out in court over the next few years. 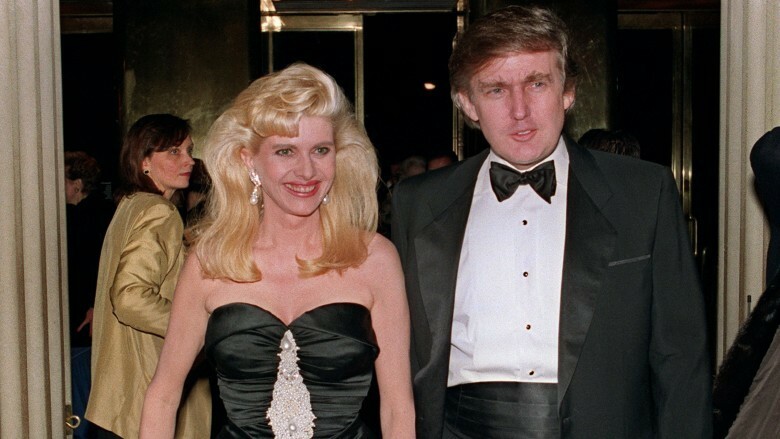 Donald got a gag order re-instated in 1992 to prevent Ivana from talking about their marriage. He also sued Ivana to win back the $25 million she received in cash, property, and other items from their divorce settlement, to which Ivana countersued, according to The New York Times. They reached a settlement in that dispute in May 1993. Incidentally, in September 2016, amid Donald's campaign for president, The New York Times and newspaper chain Gannett filed a motion to unseal Donald and Ivana's divorce records. That motion was denied. From a timeline perspective, Donald's divorce from Ivana had nothing on his subsequent divorce from Maples. The couple announced its separation in May 1997, and divorce proceedings began three months later, according to The New York Times. The case continued for about two years, until Maples finally gave up her battle over the couple's prenuptial agreement. She walked away with "a paltry $2 million," according to the New York Daily News. In 2002, Maples was set to release a tell-all book, presumably about her relationship with Donald, but the project was mysteriously scrapped at the last minute. In 2016, Ivana revealed to the New York Post that Donald thought about running for president about five years before their divorce, but the scandal that resulted from their separation made that impossible. As it turns out, Ivana had her own thoughts about life in the White House, as detailed in her January 1988 cover story for Vanity Fair. "It's not for the next ten years, definitely not," she said, when asked if it was her goal to become first lady. "There is so much to do. We have invested in this town close to a billion dollars. We can't just put it in escrow and go to the White House. It would go down the drain in a second. It's too young, too new. But in ten years Donald is going to be just fifty-one years old—a young man," she added. "What he's done in the last ten years some corporations don't do in a hundred years. Donald is interested in politics at a certain level. But I don't think he would run for mayor—he could do that so easily. That wouldn't be a challenge for him." According to the New York Daily News, the early stages of Donald and Maples' relationship were fraught with breakups and makeups, and almost always surrounded by enough gossip to keep the tabloid business booming. 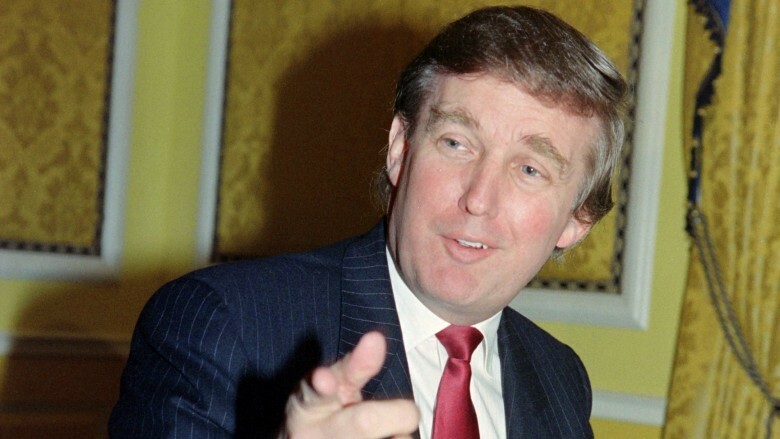 For example, in December 1991, after a year of tumultuous fighting, Maples was allegedly caught throwing a stiletto heel at Donald in the lobby of Washington, D.C.'s Four Seasons Hotel. "I'll never marry you," she reportedly yelled. For what it's worth, the Daily News said they made up the following day and went on to have a "relatively peaceful 1992," before Maples became pregnant with her first and only child, Tiffany Trump. Of course, given that the couple separated by 1997, that state of relative peace obviously didn't last. Was the press to blame for their divorce? Speaking to New York magazine, Maples placed a lot of the blame on the downfall of her marriage to Donald on the press. "If we could have somehow stayed away from the public and the press, it might have been different, but every private issue seemed to be played out on the front page," she said. "The press coverage was a destructive force in my life. It was destructive to our relationship. It was like a fire. It was like, 'We're not going to stop until we've shown that we can destroy this thing.'" In 2016, during an interview with Access Hollywood, Maples seemed much more diplomatic about her divorce, saying, "I think you always hope in a marriage that you can bring the best out in each other. But after many years, we realized we weren't, and then you have to move on." She continued, "You know girls when we're in our twenties. We want to change the men we're with, we think that love is going to make them a little softer, and you think, 'I will learn how to speak out stronger for what I believe in.' Because I'm a Southern girl, I often just smile and keep on going, but I have my own thoughts and my own views, and it's time now to express them." Even all these years later, Maples is reportedly still seeking forgiveness from Ivana for her involvement in Ivana's divorce from Donald. "[Maples] asked to apologize to me in the Daily Mail in London," Ivana told the New York Post in 2016. "They asked if I accepted the apology and I said no. Why should I? She broke my marriage!" The quote from Ivana hit Maples pretty hard. "That makes me sad because I wish her nothing but love," she told People magazine that year. "I love her kids, and if she's holding any kind of resentment toward me, I really hope, for her sake, that she can forgive me." If Maples needed further proof that Ivana wants nothing to do with her, she ought to read this report from Page Six, which alleged that Ivana left Donald's inauguration festivities early to avoid running into her. Ouch. Apparently, time really does heal all wounds (and lawsuits, for that matter). During her 2016 interview with the New York Post, Ivana shocked everyone when she revealed that, to this day, she still advises her ex-husband. "We speak before and after the appearances and he asks me what I thought," she said, adding she often tells him to calm down. "But Donald cannot be calm," she said. "He's very outspoken. He just says it as it is." 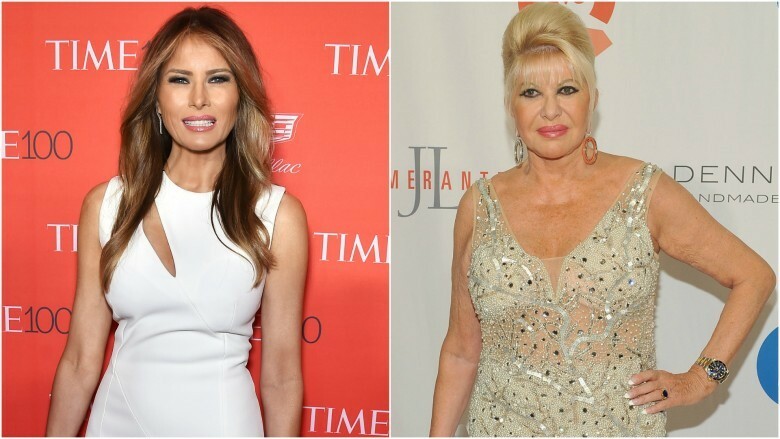 She may not have a relationship with Maples, but Ivana appears to have given the "thumbs-up" to Donald's third wife, model and jewelry designer Melania Trump. "She's going to adapt just fine," Ivana told the New York Post of the first lady's emerging role in Washington, D.C.. "She never did anything wrong to me. I wish them all the best." The Post added that Ivana is "friendly with Melania." Donald's affair with Maples and divorce from Ivana came at a time when his three children—Donald, Jr, Eric, and Ivanka Trump—were young kids, so it's understandable that Maples' relationship with them may not be 100 percent perfect. Ivanka admitted to People magazine in April 2016 that she and Maples are not close, reasoning, "She was out in California and really my relationship is with Tiffany." Well, okay, then.